Tukes Valley Middle School has earned Washington Green School certification as a Level 1 school in the category of school grounds. The school celebrated the achievement last week at an assembly, during which Clark County Environmental Services presented the school's Green Team with a certificate and Green School flag. 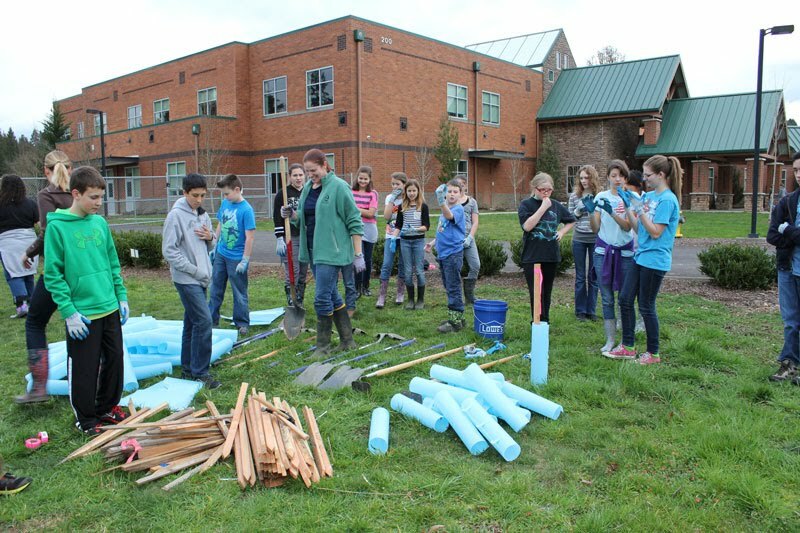 More than 50 middle school students participated in Green Team each week after school to create an interpretive nature trail and outdoor classroom in the green space adjacent to the campus, which was opened in 2008 on land that was formerly used for agricultural purposes. "We wanted to turn this amazing space into an outdoor classroom that would enrich students’ classroom experiences. It will be a great resource for teachers and students to run field studies and study ecosystems," said fifth grade teacher Amanda Jones. 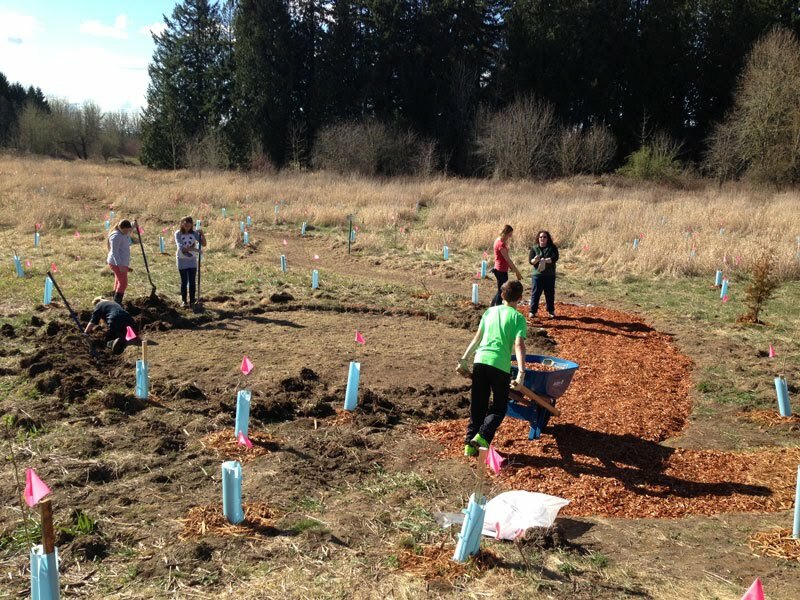 Students worked all year to restore the trail and green space to its native state with plants that are indigenous to the area and habitat suitable for birds and other fauna. "We volunteered so that we could make a difference at our school and make it greener," said fifth grader Juliann McCabe. Students began the project in the fall by studying ecosystems and learning about the plants that are native to the area and would attract birds and pollinators and would force out invasive species. Students designed a plan for the green space that included an interpretive nature trail and then got to work removing debris and garbage. Some students attended a Clark County student environmental summit. 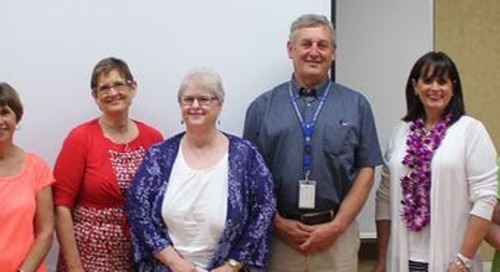 Tukes Valley teachers Amanda Jones and Natalie Keller coordinated with Clark County Conservation District, who awarded a grant to the school for the purchase of trees for the project. The organization also provided tubing to protect the young trees from rodents, such as voles, that live in the green space. 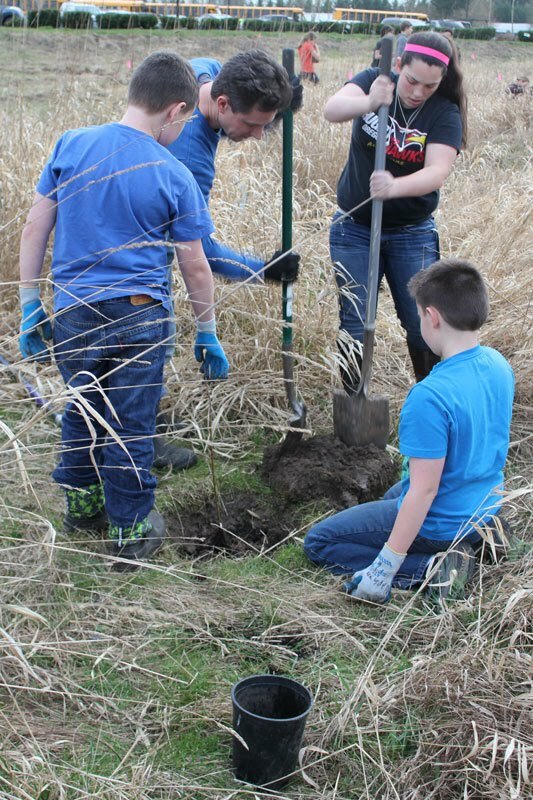 The school used the grant funds to purchase trees from the Battle Ground Public Schools' Center for Agriculture, Science and Environmental Education (CASEE), and then worked with CASEE high school students, the Conservation District and BGPS facilities to plant the trees and build a bark trail. Community members contributed a sign for the Natural Trail and bird feeders. 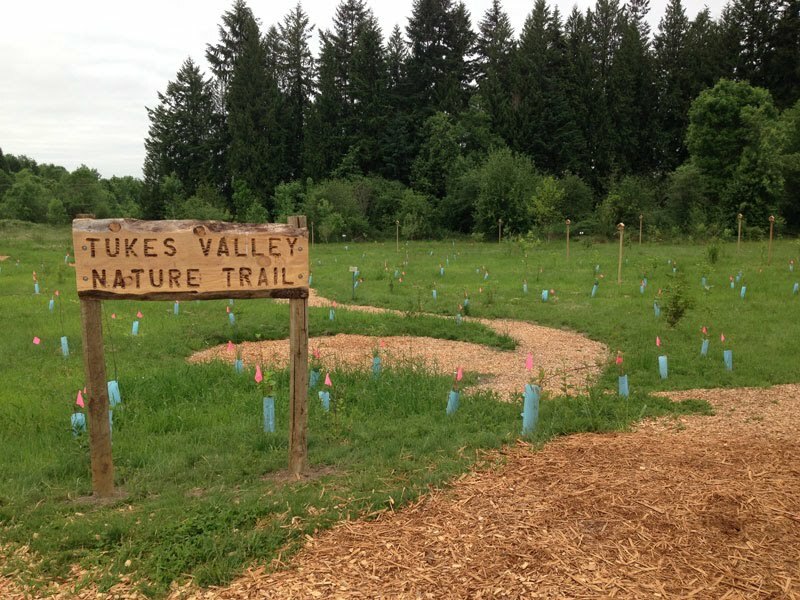 In future years, the Tukes Valley Green Team plans to extend the nature trail and create a garden as it continues through the levels of Green School certification. Science teacher Natalie Keller is looking forward to incorporating stream surveys into her science classes by using the stream that runs through the site. "This is something I've been wanting to do for a long time," Keller said. 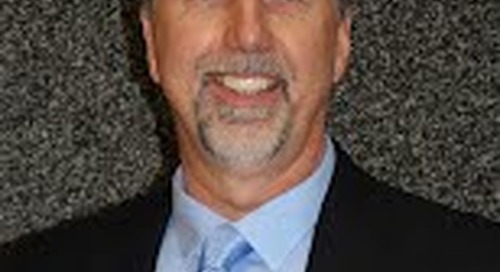 "We study ecology, and students will be able to go into our ecosystem and do biodiversity studies. We're opening up a much more meaningful, applicable science curriculum." Battle Ground Public Schools is pleased that Tukes Valley has earned the Green School designation and is encouraging other schools in the district to seek certification.